Humans have been using the start of a new year to refresh their routine and turn over a new leaf for thousands of years. But last month, it was a peregrine falcon in Frost Science’s care who received a new lease on life. Peregrines are known to migrate through Florida in the winter months. In fact, these birds of prey are gifted hunters that dive down to catch their target from above at speeds of up to 200 mph! With all our city’s high-rises and the abundance of pigeons, Miami is the perfect location for peregrines to rest and eat before continuing on their migration routes. In Miami, however, most balconies pose a significant hazard to these large birds. They often have glass railings, making it difficult for birds to distinguish between the glass and the sky. When a bird tries to leave the confines of the balcony, they hit the glass, causing injury. Luckily, Frost Science has a great team dedicated to helping injured birds of prey heal and eventually, get released. That was the case in late October, when a peregrine falcon was found injured and unable to fly on the balcony of a Brickell high-rise. It was then taken in by our Batchelor Wildlife Center in Coconut Grove where it underwent radiographs, blood analysis and careful rehabilitation with a course of medication. After a few months and several tests, the official word was in: the falcon was ready for its release! 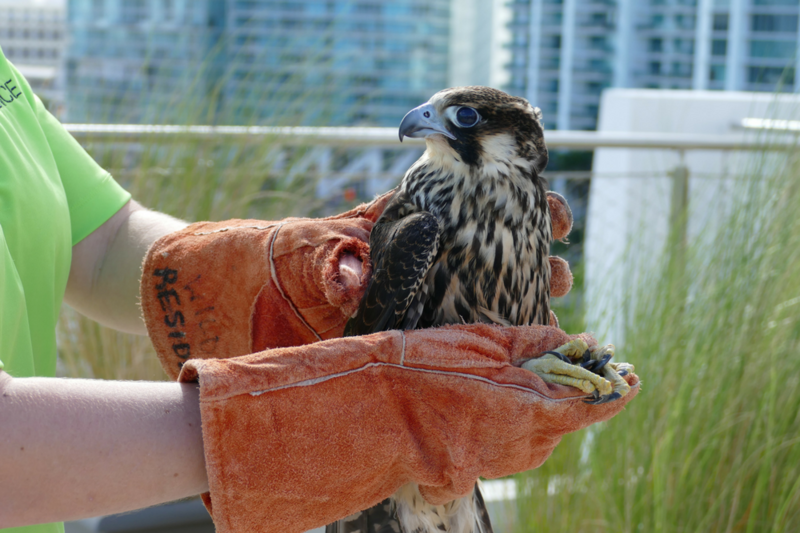 On December 6, the Frost Science staff (led by Wildlife Rehabilitation Manager Hailey Möller), gathered on the museum’s rooftop terrace to release the rehabilitated raptor into the downtown skyline. Falcons need to be released from above ground level, making our green roof the perfect site for the event. After a few words from staff members, the peregrine successfully took flight and glided into the sunny afternoon sky. Since 1991, the Batchelor Wildlife Center (currently located in our Coconut Grove site at the former science museum location) has been rehabilitating injured raptors such as peregrine falcons, Cooper’s hawks and screech owls, either releasing them back into the wild if they are fit to survive, or utilizing them in our education programs. The center takes in as many as 700 birds a year, and releases 40 percent of the raptors it sees. For more information, please visit frostscience.org/batchelor-environmental-center.